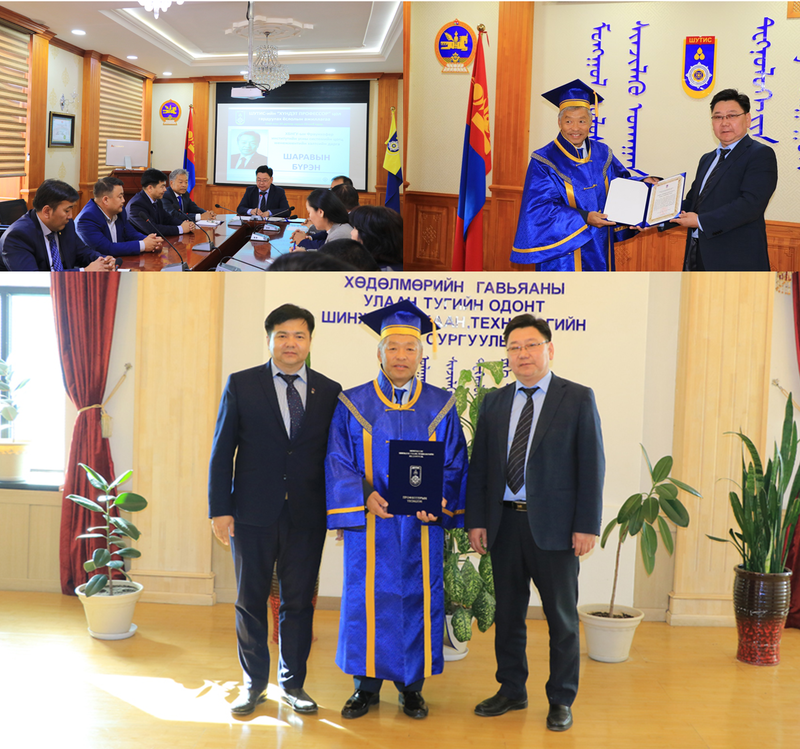 A scientist and head of the “Water technology” workstream of IWRM-MoMo project, Dr. Buren Scharaw received the “Honorary Professor” of the Mongolian University of Science and Technology. IWRM-MoMo project has been implemented since 2006 in cooperation with the Mongolian University of Science and Technology in Darkhan-Uul Province. Within the framework of capacity building program, two doctoral students successfully ended their doctoral studies and received the doctoral degrees. Moreover, the IWRM-MoMo project has been supported and developed the “Water chemistry laboratory’ at MUST Darkhan and “Pilot project site for recycling of treated waste water”. 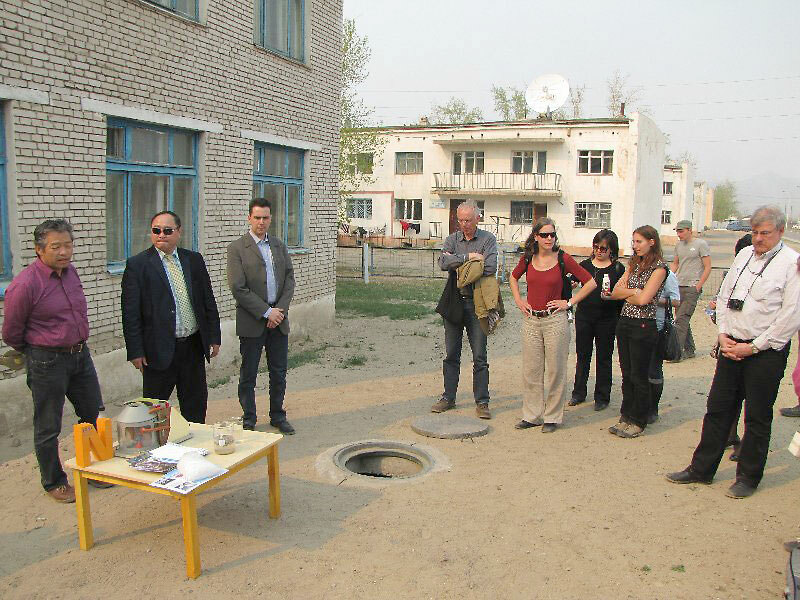 Besides, Mongolian-German scientists conducted the joint research on surface and groundwater water quality monitoring in the Kharaa river basin, determining the water leakage in the pipelines in the city of Darkhan and implementation of science based IWRM. In acknowledgment for his commitment in all of these subprojects Dr. Scharaw received the honorary professorship. About 200 national and international water experts, including a high ranked delegation of the German Ministry of Education and Research (BMBF), joint the IWRM MoMo Wrap-up and Relay Conference, 29 to 30 May 2018, in Red Rock Resort, Gorkhi Terelj National Park outside Ulaanbaatar to discuss the latest issues in Integrated Water Resource Management. Participants enjoyed the perfect setting of Red Rock Resort and engaged in numerous workshops and fruitful discussions. A highlight at the first morning was the Honorary Doctor Ceremony for Prof. Dr. Borchardt, the MoMo Project leader, who received the Honorary PhD of the Mongolian Accademy of Sciences. Other MoMo Project members were honoured as well, including Dr. Buren Scharaw, Dr. Jens Ilian and Mr. Jörn Heppeler. Furthermore Ms. Dr. Dolgorsuren presented the Kharaa River Basin Management Plan and MoMo researcher Dr. Ines Dombrowsky handed over the final versions of the MoMo Policy briefs on IWRM to representatives of four Mongolian ministeries, while Dr. Jürgen Hofmann presented the final edition of the Kharaa Yeröö River Basin Atlas. 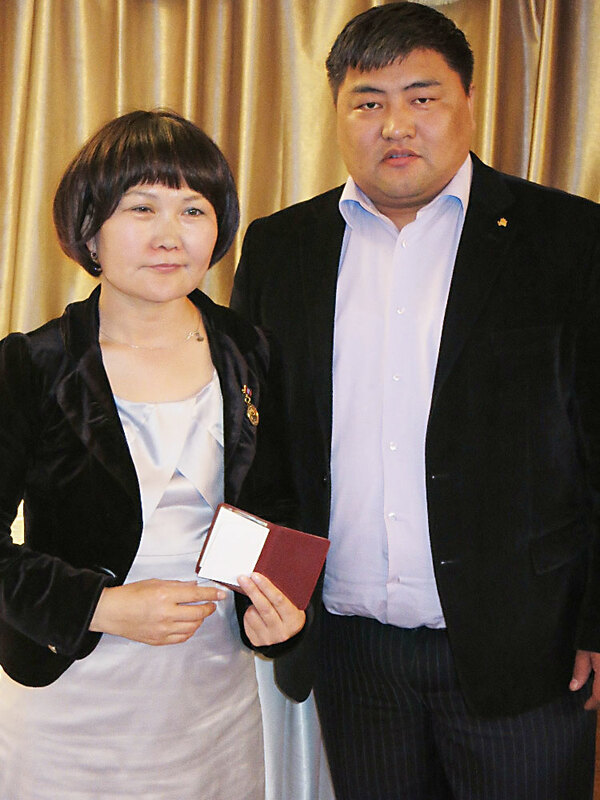 MoMo Geoportal was also transfered into Mongolian responsibility. After Lunch the scientific program of the conference started and continued until next day, only interrupted by the conference banquet in the evening. Keynote lectures and parallel sessions changed with each other. A panel discussion at the second day summarized the state of discussions and shed a light on future problems of water management in Mongolia. More than 60 international experts joined at the IWRM MoMo Transfer Conference at the 26.-27. September 2017 in Ulaanbaatar. Four parallel workshops discussed on capacity development, environmental monitoring & information management, urban infrastructure and river basin management. The bases for their discussions were the MoMo policy briefs that had been formulated in close cooperation with Mongolian ministries ahead of the conference. 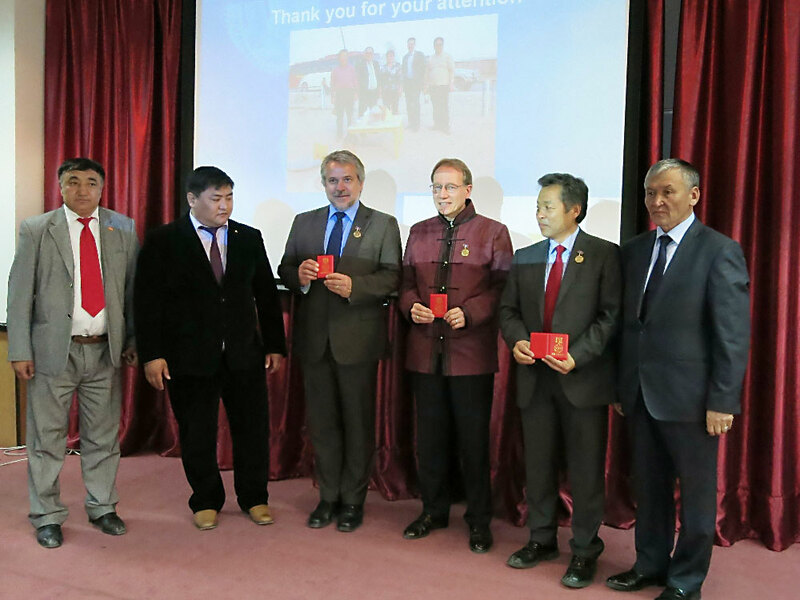 A six-headed official delegation of BMBF joined the meeting and visited German Embassy and the Mongolian Ministry of Education and later made a field trip to Darkhan. The final publication of policy briefs should take place at the IWRM MoMo wrap-up and relay conference in late May 2018, when the handover of the project results (geo-data base, river basin atlas, etc.) will take place. This meeting will comprise a scientific conference on IWRM and water issues with 300 international delegates. Left: Prof. Borchardt during his talk. Right: Members of the workshop on urban infrastructure. Above right: Dr Alecke from German BMBF. Above left: Dr. Hofmann gives copies of the Kharaa River Basin Atlas to Mongolian colleagues. Mid: The audience of the MoMo transfer conference. Below: MoMo members and guest at the end of the conference. 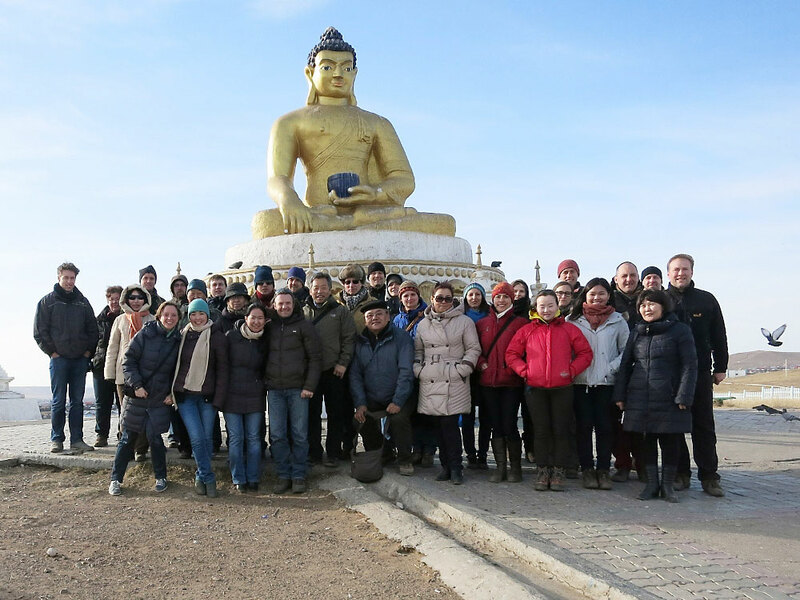 During the IWRM MoMo Transfer Conference six delegates of the German Federal Ministry for Education and Research visited Mongolia for one week. 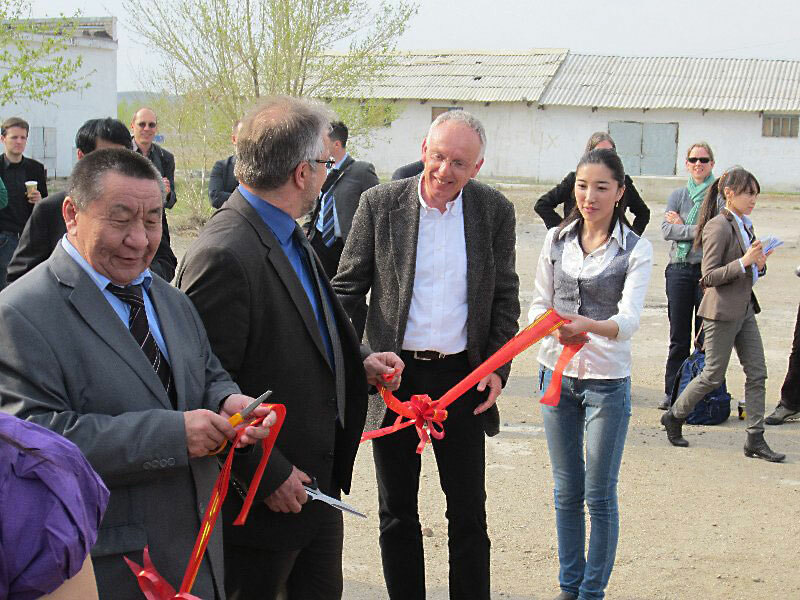 Besides their offical visits to their colleagues in the Ministry for Education, Culture, Science and Sport (MECSS) and to the German embassy in Ulaanbaatar they also made a trip to the MoMo field sites near Darkhan. The next official delegation will come to UB in May 2018 to visit the IWRM MoMo wrap-up and relay conference. 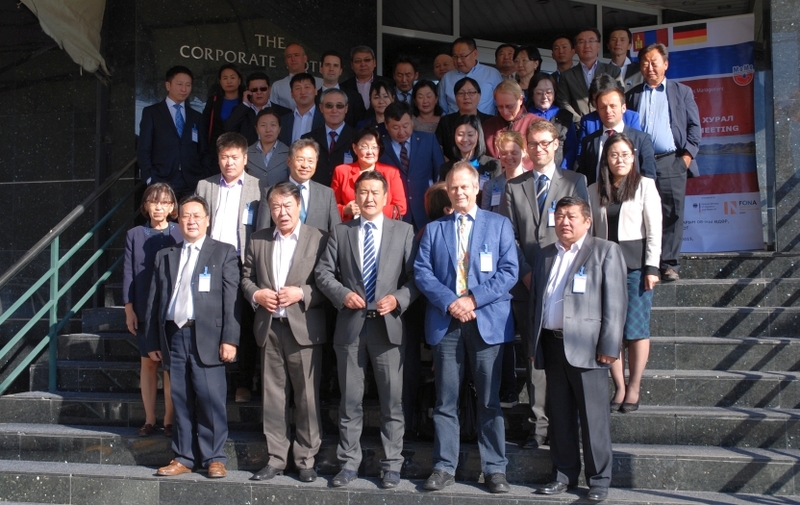 MoMo members and BMBF delegates in the centre of Ulaanbaatar. In the upcoming weeks the MoMo Geoportal will be available in a new design. 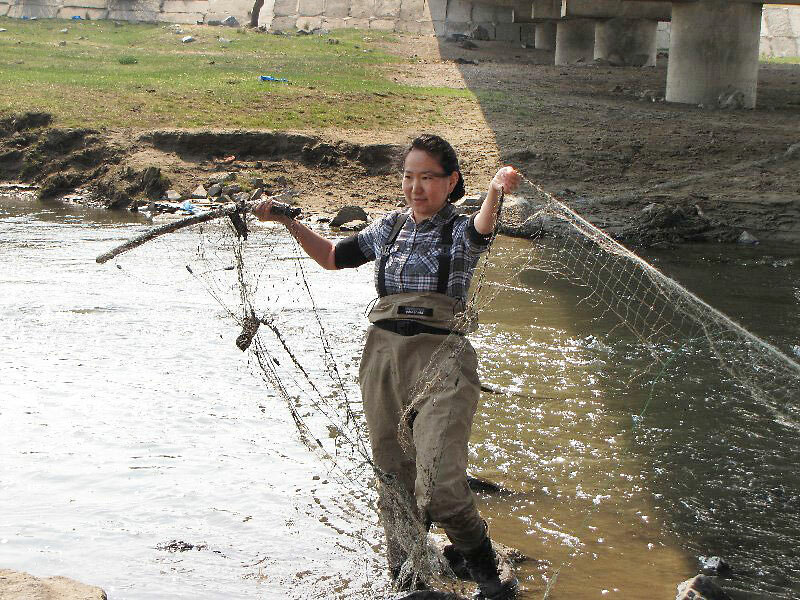 Monitoring with innovative technologies in Mongolia: MoMo will develop a sustainable environmental monitoring system for river floodplains Kharaa River Basin. Besides the official MoMo kick-off meeting a first workshop on "Environmental Monitoring" has been held in Ulan Bator at the Institute of Geoecology of the Mongolian Academy of Sciences (MAS) with MoMo team members from IGB and HTW Dresden. The target is to set up a sustainable, remote sensing and GIS based monitoring system for the river floodplains and their ecosystem functions. During a first joint field campaign from 26 to 29 August 2015 first mappings of selected river floodplain sections have been performed by using small drones (UAS). 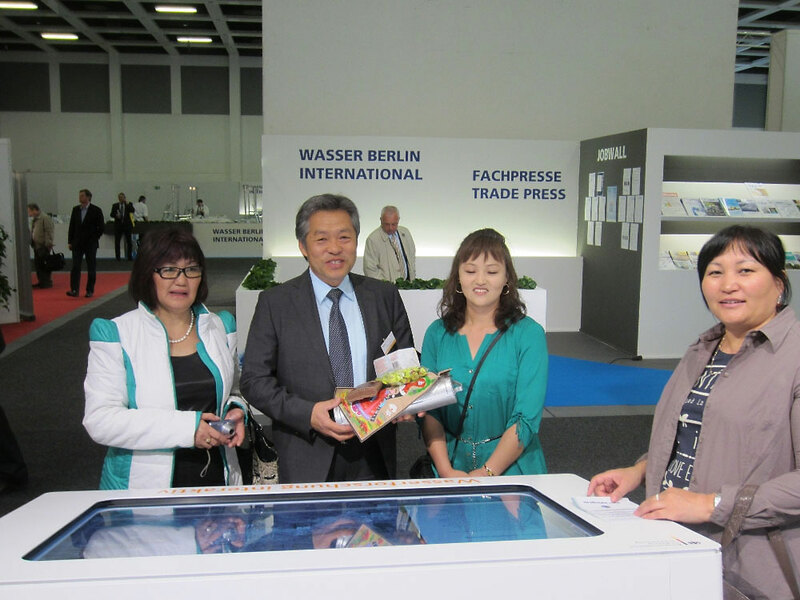 Several activities and courses for capacity development in Germany and Mongolia will follow. The team of IGB (PD Dr. Hofmann), HTW (Prof. Oczipka, Prof. Block-Berlitz) and MAS (Prof. Amarsaikhan, Dr. Avlyush, Dr. Javzan) during the first Workshop on "Environmental Monitoring with innovative technologies) at 24.08.2015 in Ulan Bator (Foto: Block-Berlitz). In September 2015 around 50 representatives from science, administration, politics and economy came together and discussed results and further activities of the MoMo project. The start of the third phase of the project opens up opportunities for implementation and multiplication of project results. In main areas of discussion centered around the modules of the project: (i) river basin management, (ii) environmental monitoring, (iii), water technologies and (iv) capacity development. 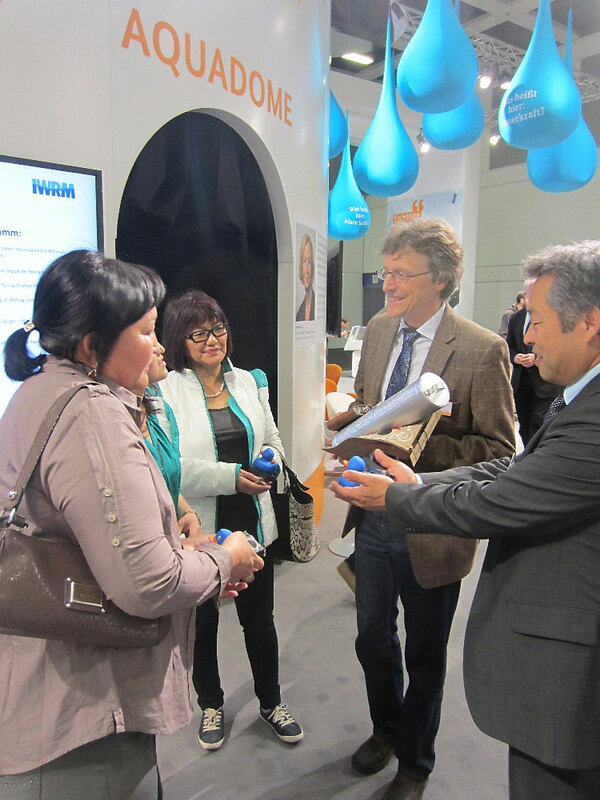 Results of the IWRM MoMo project were presented at the Water Berlin 2013, a trade fair and congress held from 23 to 26 April 2013. Scientific and technology implementation results of the project were shown both in an animated film in the AquaDome and on interactive touchscreens. Moreover, several visitors, including a Mongolian delegation, used the opportunity to for a personal conversation with project representatives. The MoMo Statusworkshop 2013 consisted of a scientific conference and two excursion days into the upper and lower Kharaa River Basin. 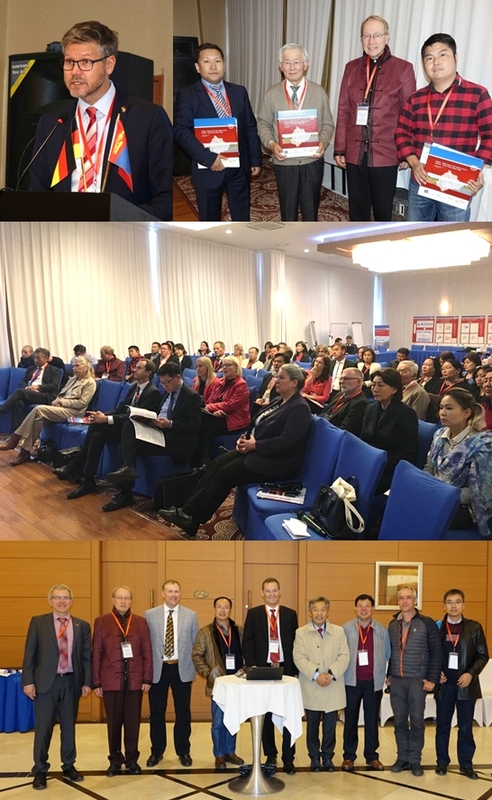 During the scientific conference, held on 16 April at the Mongolian Japanese Center in Ulaanbaatar, the scientific and technological results of the project were presented, and conclusions from a management perspective discussed. At the end of the workshop, four representatives of the IWRM MoMo team were awarded with medals of honor in recognition of their outstanding long-term committment for water resources management in the Kharaa River Basin. Among those who received awards were the head of the project, Prof. Dr. Dietrich Borchardt (UFZ Magdeburg), PD Dr. Juergen Hofmann (IGB Berlin), Dr.-Ing. Buren Scharaw (FhAST Ilmenau) and Mrs. Gerel Osor of the MoMo office in Darkhan. The second day of the status workshop focussed on capacity development and the monitoring of water availability and quality in the upper Kharaa River Basin. 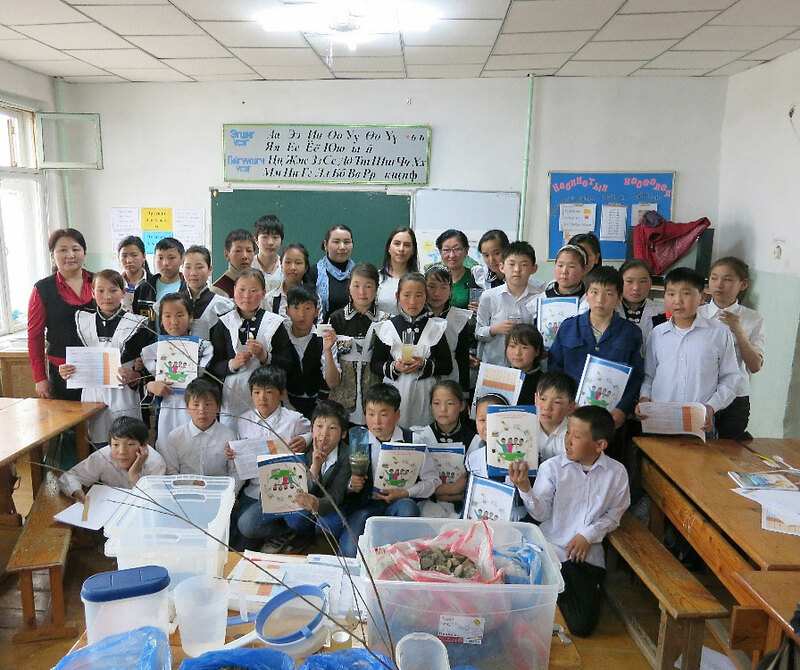 At a school in Batsumber, students and their teachers demonstrated the success of a school network and the "Water Fun" training program for teachers. 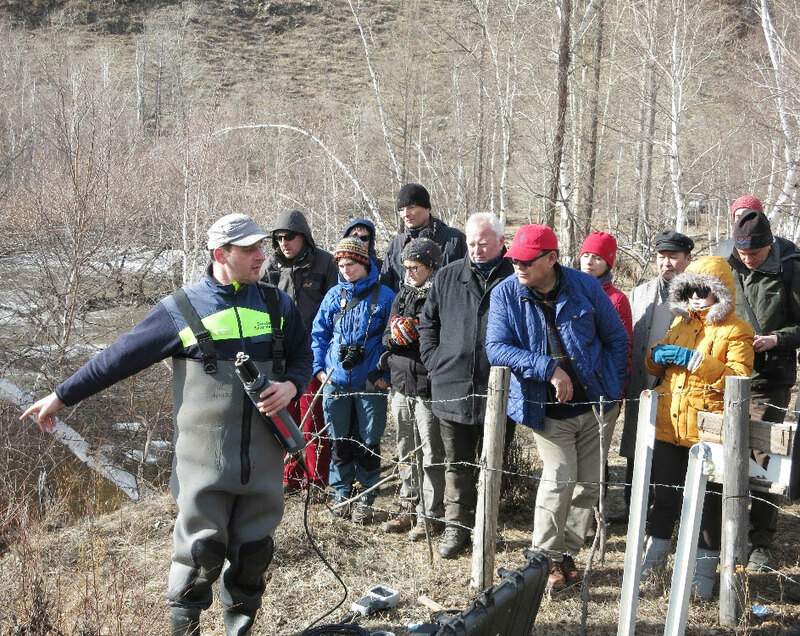 Afterwards, the results of hydrometereological research and water quality monitoring were shown and discussed in the Sugnugur Valley. Among the participants were representatives of the Mongolian Ministery of Environment and the director of the state-owned company for water infrastructures. The implementation of activities related to urban water management was the thematic focus of the workshop´s third day. Experiences from the pilot operation of two waste water treatment plants (an SBR reactor on the site of Darkhan´s central WWTP and an experimental plant combining wastewater treatment and wood production) were discussed. The iPiT (integrated personal innovative toilet) and a biogas plant were shown as components of a holistic concept for waste water management in ger areas. 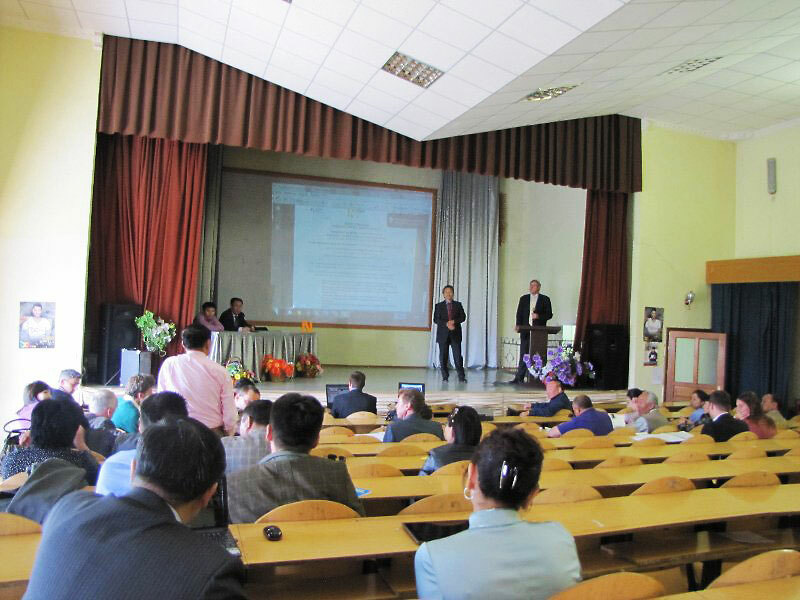 "Implementing IWRM in the Kharaa Catchment" this was the motto of the MoMo projects status workshop which took place from 15 to 17 May 2012 at the Mongolian University for Science and Technology (MUST) in Darkhan. Presentations of important scientific findings and their discussion formed the core of the first day. This included new insights from the environmental monitoring including its relevance in the context of IWRM, as well as progress of the measures related to urban water management and capacity development. 18 oral presentations were complemented by a poster session and the inauguration of a constructed wetland integrating waste water treatment and wood production, which is located next to MUST. was characterized by an excursion to locations around Darkhan where a variety of activities were presented. The excursion program began at the bank of the Kharaa River with a demonstration of the ecological monitoring program of the project. This included the physico-chemical water quality monitoring and the assessment of the aquatic fauna. A second destination was Darkhan´s central wastewater treatment plant, where the functional principle of the SBR reactor was explained and experiences from the first year´s operation discussed. The excursion then continued to the ger districts of Darkhan. The presentation of the iPIT toilet system highlighted the aspects of user satisfaction and the reuse of urine and feces and pointed out improvements over conventional ecosan systems. 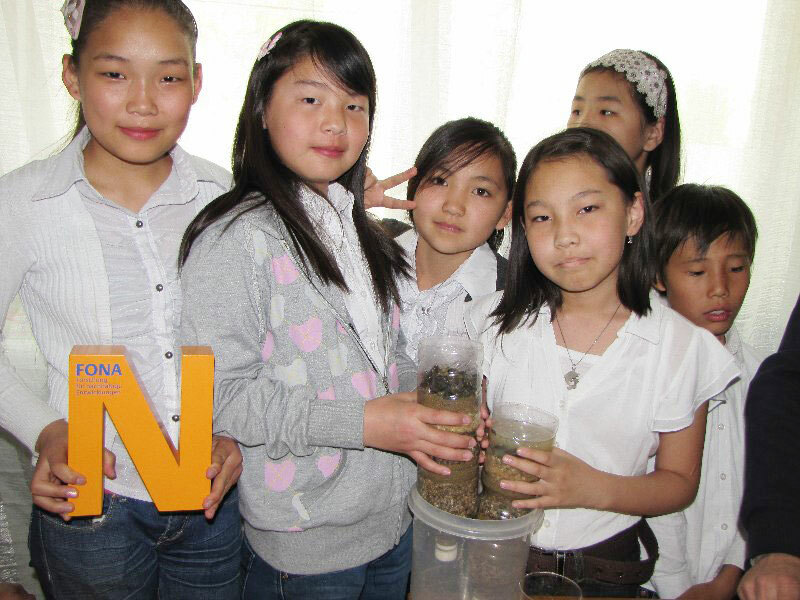 Activities in the framework of the Kharaa school network, one example of the project´s capacity development, were showcased at School 19 in Darkhan. Students were seen in action testing different water quality parameters and building a simple waste water treatment system â€� like a MoMo project in small. 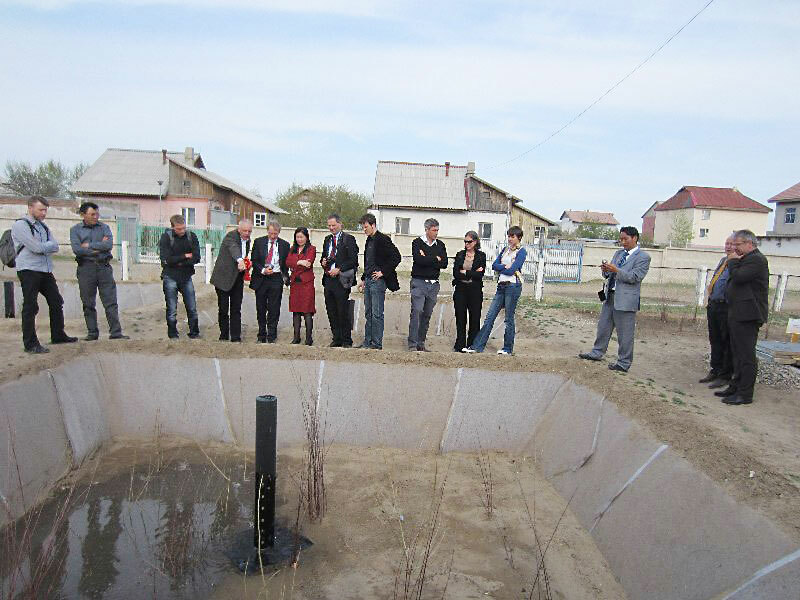 The day´s program finshed with a visit in Orkhon Sum, where a small waste water treatment plant located next to the local kindergarden was visited. Representatives of the local administration and several ministeries recognized the WWTP as an exemplary and well-adapted decentral solution for which there is a great need in Mongolia. Most workshop sessions of the third day took place in specialist groups. Topics included a discussion with the newly formed Kharaa River Basin Council and the reconsideration of strategies in monitoring and capacity development. Moreover, the relevance of ecosystem services in the context of IWRM was discussed. Dr. Philippe Bergeron, a consultant to the project in the framework of the "Asssistance for Implementation" initiative chaired a session on a mainstreaming strategy of MoMo innovative solutions. 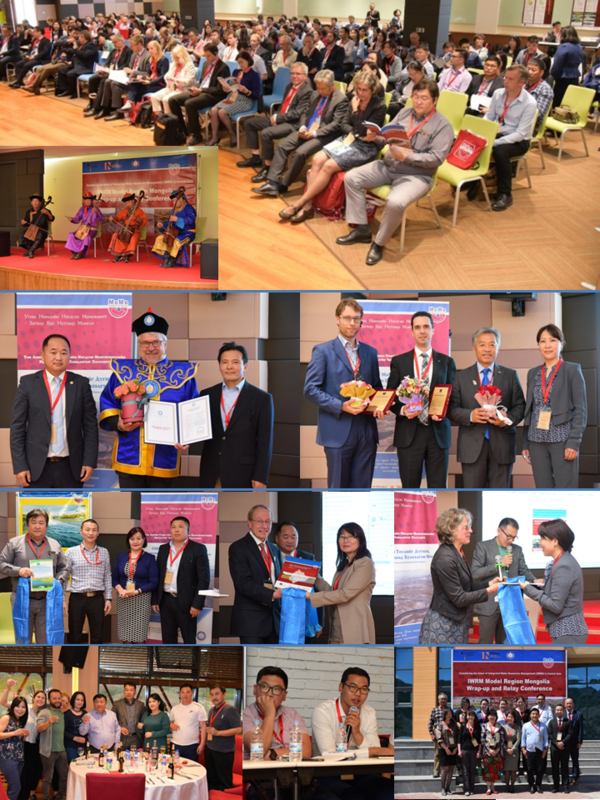 Representatives of the administration, Mongolian and German companies, the scientific community and local NGOs analysed and debated about the related potentials. The program was complemented by a presentation of the ArsoLux biosensor, a detection system for arsenic developed outside the MoMo project which is well suited for water testing even in remote places. 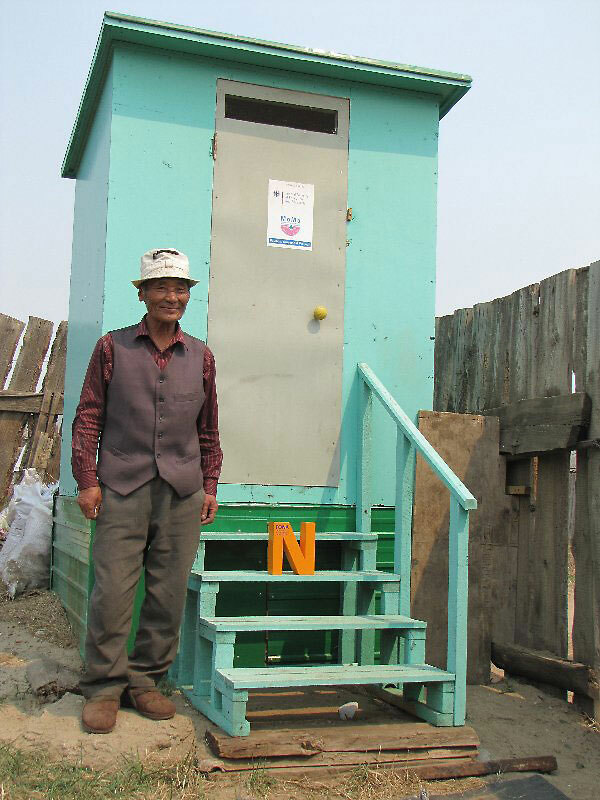 There is increasing evidence for arsenic contamination in several parts of Mongolia, and ArsoLux could be the technology of choice for a blanked screening since the system is compact and allows a high throughput of samples in a short time. After the end of the thematic sessions, the project´s coordinator, Prof. Dr. Dietrich Borchardt and several representatives of the MoMo team expressed their gratitude for the accomplishments of local project partners. In particular, Mrs. Tschimegsaikhan from the project office in Ulaanbaatar and Mrs. Gerel from the project office in Darkhan were thanked for their support to the project team in general and their contributions towards a successful project workshop. the status workshop was an important milestone on the way towards the implementation of an IWRM in the Kharaa River Basin. Local stakeholders received up-to-date information on the state of regional water resources and management options and discussed, together with members of the project team, potentials of transferring and further advancing the project solutions. In the mid-term perspective, these results will form an important basis for the river basin management plan to be delevoped for the Kharaa River Basin. MoMo Capacity Development Coordinator "Best Scientist in Mongolia"
Prof. Dr. Dr. h.c. Michael Walther, head of MoMo´s cross-sectional module "Institutional Analysis und Capacity Development", was awarded the honorary title "Best Scientist in Mongolia" by the Mongolian Ministry of Education, Culture and Science. The award was presented in recognition of Prof. Walther´s long-term commitment in the field of environmental studies, particularly climate and landscape research and education for sustainable development. 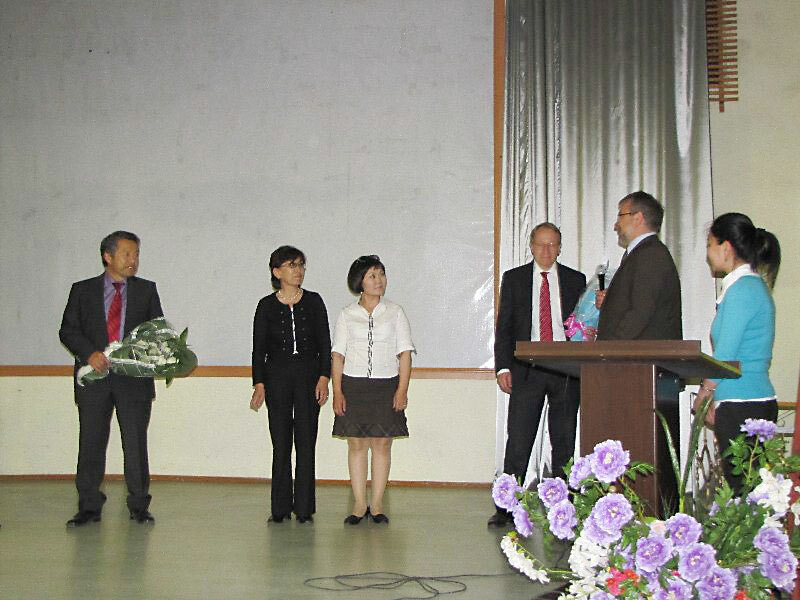 The MoMo project team congratulates Prof. Walther for this success, as the award is normally given to Mongolian scientists. IFAT Entsorga, the world´s leading trade fair for water, sewage, waste and raw materials management in Munich. 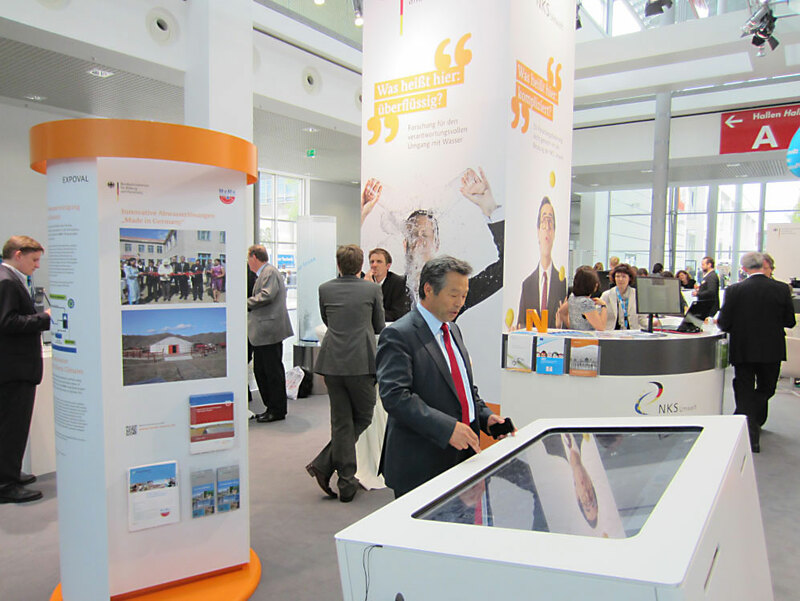 At the stall of the BMBF, directly located at the eastern entrance to the trade fair, the MoMo project was represented in several ways. 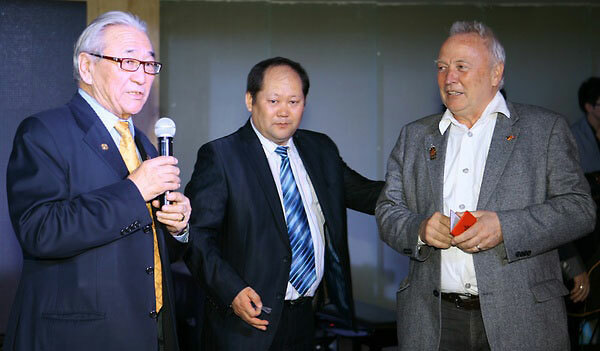 In the Aquadome, the film "Water for the Mongolian Steppe" provided an overview of the situation in the project´s target region and showcased selected work packages. A version suitable for screen display will be available for download soon. An interactive touchscreen system allowed users to individually select information that they are interested in, including texts, photos and films on the environmental monitoring, urban water management and capacity development activities of MoMo. Many visitors also used this opportunity for a personal talk with project representatives present at the stall. In addition to the film and touchscreen system, the new MoMo project brochure was for the first time presented to the general public and is available for download.